It’s been a while but this weekend we are heading up the Lakes with the boys, the tent and the running shoes. L picks me up from work and I manage to get out at 4:30pm to aid with any M6 hold ups.. When we get to the Langdale Campsite it is deserted which isn’t normal. Even at the most obscure times of the year they’ll be a dozen nutters camping at least. There are a few campervans, which L is eyeing up naturally, but no tents. This is probably because of the near gale force winds... which we certainly didn’t have back in Nottingham. No matter, we find a safe, sheltered spot and pitch the tent. Another tent does quickly join us which makes us feel a bit better. Then we head for an Old Peculiar at the Old Dungeon Ghyll. The next morning the campsite attendant is shaking his head at us pitching at all and revealing that he had considered closing the site. I’m not sure what we’d have done had he done that. The wind has now lessened a touch, so he has no problem with us stopping Saturday night. 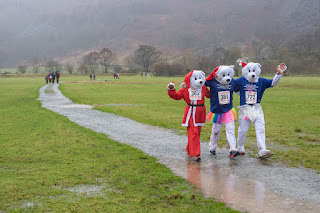 Which is a good job because the main reason we are here is for a race that we have run many times before, Saturday's Great Langdale Christmas Pudding 10K run which is under new management this year. 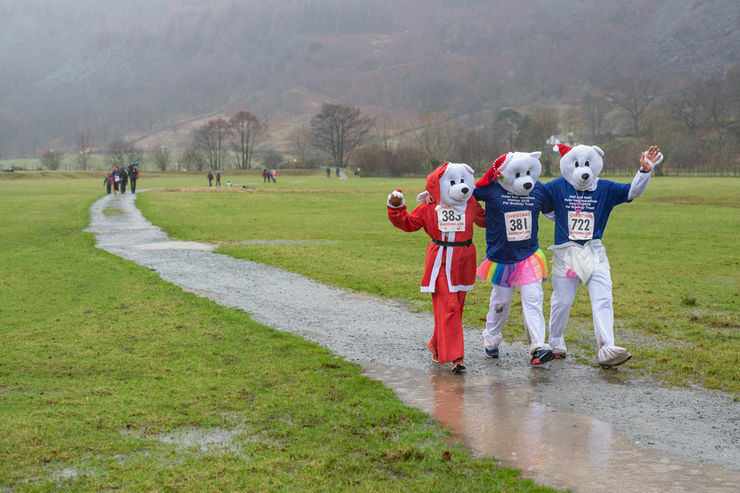 The Brathay Trust, who are based in Ambleside, have taken over the running of this race along with the Langdale Half and Full Marathon. The youth charity already organises the Windermere Marathon. This year it is the 30th running of the event and the new organiser has invited the long time previous organiser, Rod, to start it. Then a thousand of us, less those who have wimped out because of the high winds and cold wet weather, set out from outside the New Dungeon Ghyll Hotel at 12.10 once the local bus has been let through. This year there is a new course which I was a little worried about, and I wasn't only one. Rather than being the practically out and back run of old the route now takes us around the back of Elterwater village and back to Langdale via Baysbrown Farm which must surely have off-roads sections? Apparently not, it turns out that due to some excellent footpathing, it doesn't. It isn’t easy though and it was at Elterwater that it started to get serious with a climb that went on far longer than I recall from when we've walked it. There was a reward for completely this part though and I could smell the drinks station probably half a km before I reached it. Yep, smells like mulled wine to me. It's not really good athletic practice to stop for such things but I wasn't going to pass up on this. That sort of spurs you on to the finish which is in the muddy swamp that used to be the field in front of the New Dungeon Ghyll. I then rush to get some clothes on and to warm up, just as the rain starts again with poor L still out there. The other change the organisers have made is to downsize the Christmas pudding. It is no longer one you can feed your whole family off on Christmas Day but a tiny individual one. Which for us is probably better, it might actually get eaten, and we already have one for Christmas Day from the Heanor run. Some folk resorted to fancy dress to keep warm. Then we have a pleasant evening in the Sticklebarn. I'm still not overstruck with the food or the beer there but I think all four us deemed it too far to walk to the Wainwright's in Chapel Stile. On Sunday morning we pack up camp but before heading home we go for a hearty breakfast back at the New Dungeon Ghyll before some early Christmas shopping at the legendary Co-Op in Chapel Stile.